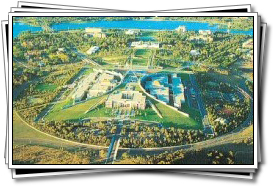 With a population of 300,000 Canberra is Australia's only inland city. Borne as a compromise to the dispute over which city should be Australia's capital, Canberra was founded in 1913 and is a fully planned, architecturally designed, ultra modern city located roughly half way between Sydney and Melbourne. Its "mid way" location makes Canberra an idea destination for those visiting the cities of New South Wales and Victoria. Canberra boasts excellent restaurants, a magnificent art gallery and impressive museums. The Australian war memorial is well worth a visit, as is Mount Ainslie. A drive through the Embassy Row of Yarralumla provides an amusing display of embassy and high commission buildings, each one appearing to represent its country's personality. If you're visiting in September be sure to see the month long Floriade flower festival. From March to May Canberra's Season of Festivals brings the city to life with dance, music and multicultural events. Art lovers can visit the Festival of Contemporary Arts in October. Canberra is roughly half way between Sydney and Melbourne and thus perfect for anyone wishing to visit a number of Australian cities without having to fly or drive for days on end. But there are other places to visit that are even closer such as Jarvis Bay, one of New South Wales' most famous white sandy beaches. Or if you would rather ski, try Mount Kosciuszko in the Snowy Mountains. If you prefer sleepy little villages make sure you plan a day trip to the Southern Highlands. Morton National Park is another great place to visit and, like the others, only a few hours' drive from Canberra. 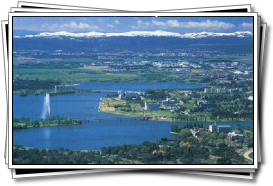 The temperature in Canberra varies considerably from summer to winter. In December, January and February the weather is typically warm and dry. Temperatures can reach 30°C with continuous sunshine. On winter days the daytime temperature rarely exceeds 10°C and usually drops to freezing at night. Sleet, snow and rain are common between May and September. In spring or autumn when the weather is the mildest.